Indigo blue hues deepen as the sun sets on the Amalfi Coast. Salty sea air tousles my blonde locks as I quietly sip on limoncello. Clanging wine glasses and the gentle hum of a distant Vespa become a symphony of sorts. The scent of lemon fills the air. 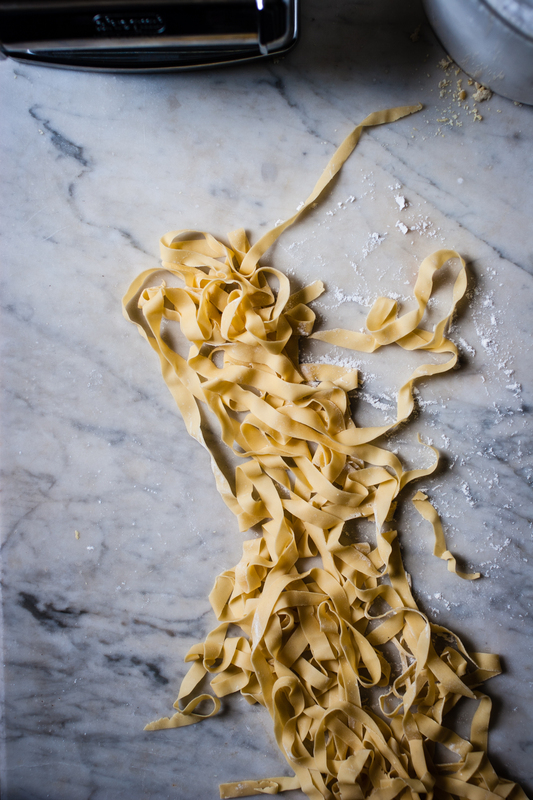 Silky strands of handmade pasta against bursting tomato flesh and fresh basil gives me a certain pleasure. Suddenly, the whistle of my teakettle brings me back to reality. I get up from the couch to make another cup of coffee, all the while dreaming of the wonderful cookbook Wild Rosemary & Lemon Cake by Katie & Giancarlo Caldesi. I devour cookbooks as if they were novels with characters to be discovered and cultures to be revealed. Not only am I allowed to engage in the narrative behind the recipe, but I also get to create, consume and share these experiences with others. As I dig deeper into a new cookbook, there are usually those few recipes that stand out in my mind, tugging on my arm like a child begging for attention until I am compelled to hunker down and give them the consideration they deserve. The pasta chapter is what did it for me. 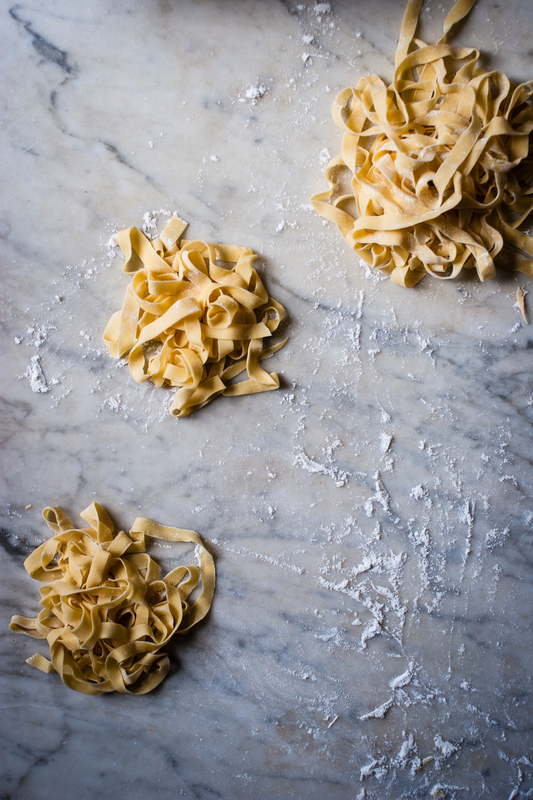 I’d been eyeing the silky strands of pasta daily, and I couldn’t take it anymore. I need to make pasta, now. As I begin to knead the homemade pasta dough on my cool marble surface, I take time to relax and completely focus on the task at hand (quite literally)! There is something deeply therapeutic about repeating the same motion over and over again and being able to feel the dough come together in your hands. It’s an empowering sensation. Everything else falls away and in that moment, I imagine being on the Amalfi Coast as the scent of fresh pasta fills my quaint loft. I believe cooking is one of the greatest ways to feel connected with someone else’s culture. Recipes bring me to every corner of the globe without having to leave home. They allow my kitchen to be an escape; a place of wonder, filled with new experiences, tastes and adventures. One of the greatest joys in life is cracking open a cookbook and becoming lost in the stories behind the recipes, which have a way of focusing on life and celebrating it. 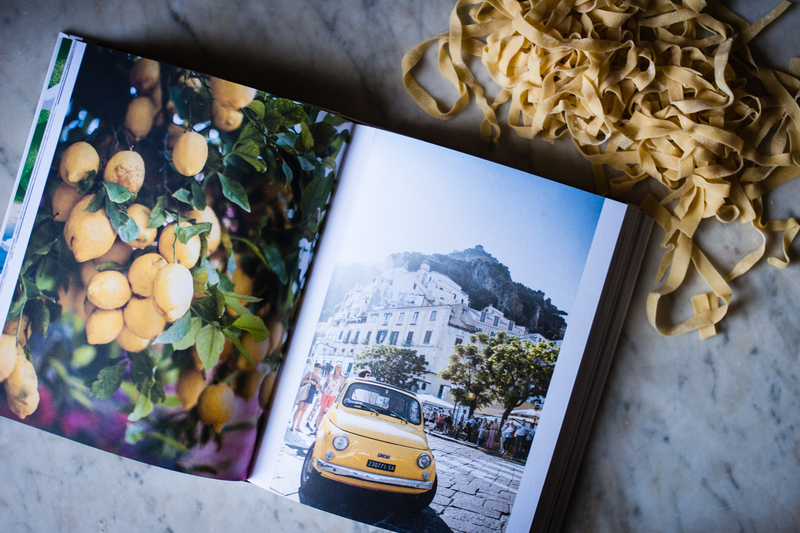 The pages of Wild Rosemary & Lemon Cake are filled with beautiful photos and recipes from the Amalfi Coast. Below is a lovely recipe for homemade pasta and a few of my favorite quick pasta sauce recipes from this lovely book. Ciao, y’all! 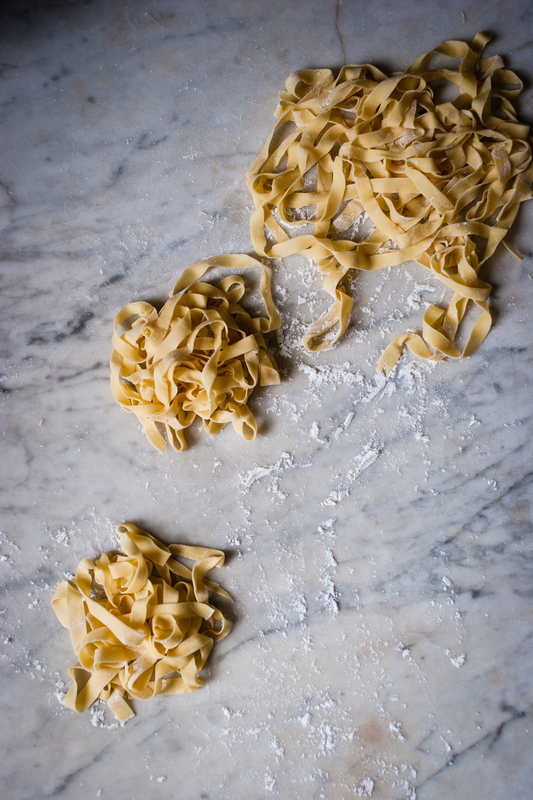 Note: The rule for fresh pasta is that you use one egg per 100g of flour. I tend to use a few teaspoons of extra-virgin olive oil as well to keep the dough from drying out too quickly. Place the flour and kosher salt in a bowl. Combine with a fork and create a well in the center. Crack the eggs in the well and add the olive oil (if desired). Stir the eggs and oil together with the fork, while gently incorporating the flour as you work your way outwards. Continue mixing until you have incorporated all of the flour and a dough ball begins to form. Remove the dough from the bowl onto a floured surface and knead the dough by hand. Stretch and roll the dough over itself, adding more flour if the dough begins to stick to the palm of your hands. Enjoy this kneading process because it does take about 10 minutes to come together! A good way to know if the dough is well blended is if the dough is completely one color, not yellow and white. If the dough becomes too dry, add a few drops of water. Once the dough has come together, wrap it in plastic wrap and allow it to rest for 20-30 minutes on the counter. 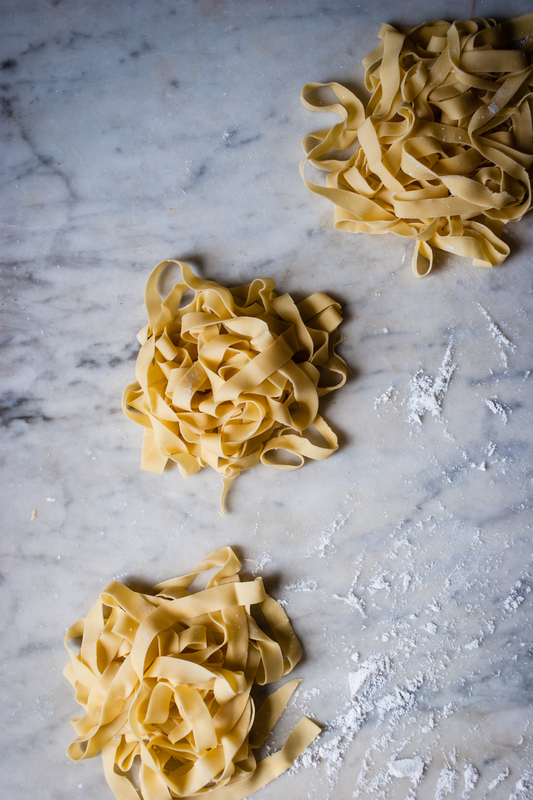 After it has rested, it will be ready to be rolled out by hand or through a pasta machine. Note: If you are using dried pasta for these quick sauce recipes, being cooking the pasta before making the sauce; if using fresh pasta, make the sauce first. Also, use a large pot of well-salted water to cook the pasta in so that it can move around freely and it won’t stick together. In a large frying pan over medium heat, combine the cream, lemon juice, salt and pepper. Cook for about 5 minutes to slightly reduce and thicken. 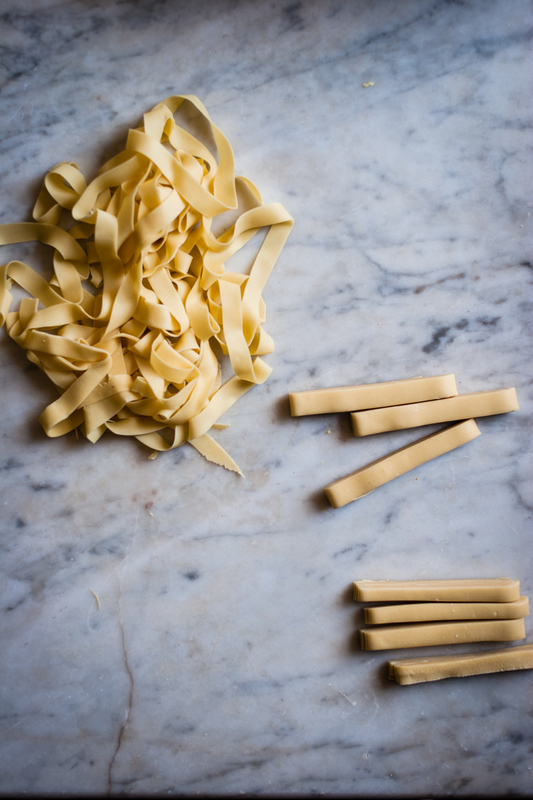 Whether you are using fresh pasta or dried, drain the pasta (see note) and toss it with the sauce and add the Parmesan cheese. Serve the pasta in warmed bowls immediately. In a large frying pan over medium heat, heat the oil and fry the garlic and red pepper flakes together for 1-2 minutes. Immediately add the tomatoes, half of the basil and salt. Squash the tomatoes with the back of a spoon. When the pasta is al dente, toss it into the sauce, along with a tablespoon of the pasta water to lengthen the tomato sauce. Stir the pasta into the sauce and allow it to finish cooking (this will allow the pasta to absorb more of the flavor of the sauce.) Add the remaining basil leaves and toss again. Serve in warmed bowls with a sprinkling of Parmesan cheese.